Made by Electronics USA in California. 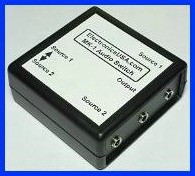 These generically labeled A-B type switches will choose between any two stereo audio source inputs or outputs. Great for portable MP3 players, satellite radios, smart phones, CD players, etc... For use with standard 3.5 mm ( 1/8 inch ) stereo mini plug TRS (tip, ring, sleave) type connectors. They connect easily and neatly to your audio equipment. So if you're looking for 2 inputs to 1 out, or 1 input to 2 outputs, we have a solution for you. The MK-1 Chooses between two different input sources to one output. The MK-2 selects one input source to two separate outputs. 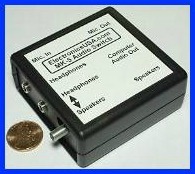 MK-5 Computer Headset / Headphone Speaker Switch : Useful & Convenient! This small, mini audio switch box ends the hassle of switching between your computer speakers and headphones. 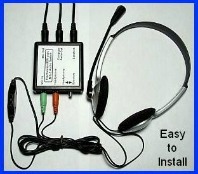 GREAT for internet phone and video conferencing applications. This model includes microphone feedthrough jacks for easy "front panel style" installation of your microphone as well as your headphones. 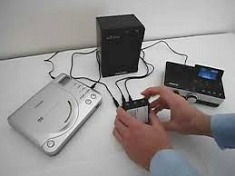 The connections from the sound card on the back of your computer are effectively moved to a convenient and accessible position on your desk. MK-7 Computer Audio Speaker Switch : If you have TWO computers, and you want to use them with ONE set of speakers, the MK-7 is your computer audio switching solution. MK-10 Computer Audio Speaker Switch : If you have ONE computer, and you want to use it with TWO sets of speakers, then the MK-10 is your computer audio switching solution. Works as an audio selector for computer speakers. 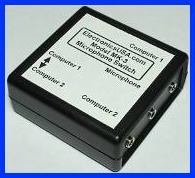 MK-3 Computer Microphone Switch : If you have ONE microphone, and you want to use it with TWO computers, then the MK-3 is your switching solution. MK-4 Computer Microphone Switch : If you have ONE computer, and you want to use it with TWO microphones, then the MK-4 is your switching solution. This switch is especially useful if you want to switch between your monitor's microphone and a headphone-microphone headset.